Delta Machine & Tool Co., a precision CNC machining business, provides a comprehensive offering of machining and assembly services. As a Tier-One supplier to OEMs, we have a long track record of managing complex supply chains, ensuring timely delivery of high-quality products. Delta is an AS-9100, Rev. 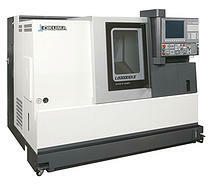 C certified manufacturer of precision machined components and assemblies. From Design through Final Inspection, we have over 35 years of experience as a trusted Tier-1 supplier to OEMs serving demanding industries. Delta Machine and Tool Co., Inc. was recently awarded the Performance Excellence Award from a leading Aerospace and Defense OEM. Delta Machine & Tool continues to invest in advanced CNC technology and tooling capabilities. Recently, Delta acquired an Okuma LB3000EX-II, a multi-axis, twin spindle CNC lathe with Live-Tooling capabilities.